Half-Life 3 release is possible? Half-Life 3 game is one of the most anticipated projects of all times. After the great success of the previous series' parts, millions of fans are begging Valve for Half-Life 3 release. And finally it actually may happen. Yesterday Valvetime.net published interesting inside information that shows the list of the Valve's games that are currently under development. Among them the journalists with a great surprise have found Half-Life 3 game and the third version of Left 4 Dead. 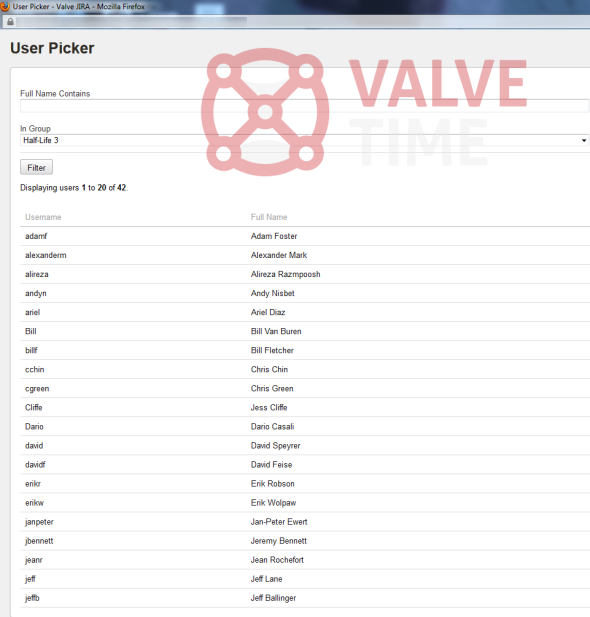 The only one conformation that we already have is a screenshot of Valve's tracking system provided by an anonymous source. Here you can see the group of employees that are linked to a very intriguing project - Half-Life 3 game. But when this team appeared in the system and what it actually does, still remains unknown. And not only Half-Life 3 release is scheduled in the Valve's system. There are about 800 other projects mentioned here. Follow the link to see the whole list. Of course, Valve didn't confirm anything about Half-Life 3 game and other projects, but at least we have a hope.